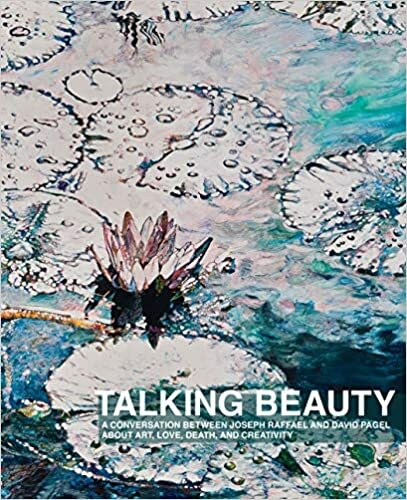 For those who have stood before the paintings of Joseph Raffael, one of the most important artists of today and the last century, holding this book whose cover is a reproduction of one of his aqueous wonders of water lilies will create an immediate sense of love. This superb book is as unique as the two artists about who the contents share philosophy and both great concepts and simple moments. It is timeless and it is very contemporary as it is the saved version of a year of email communication between visual artist Joseph Raffael and literary artist David Pagel. While Joseph’s name is well known from his extensive museum exhibitions of his paintings of nature, David Pagel is equally well known for his brilliant art criticism and art catalogue essays that have appeared around the globe as much as Joseph’s extraordinary paintings. The book is generously created with images of Joseph’s paintings as well as images of the nature he enhances and photographs of David’s and Joseph’s families. The visuals are lush and tender. But the joy of this book is slowly reading the interchange of ideas form the exchanged emails between these two men – comments on life, death, art and artists, writing, creativity, children, pets – all blended into a wondrous tapestry of the essence of being truly alive.